Throughout the course of an academic year, faculty, staff, departments and campus organizations offer a myriad of activities, programs, initiatives and services to students. While these offices offer programs and activities, most are not able to provide outreach and consultation except through students’ intentional visits and appointments at an office or facility. 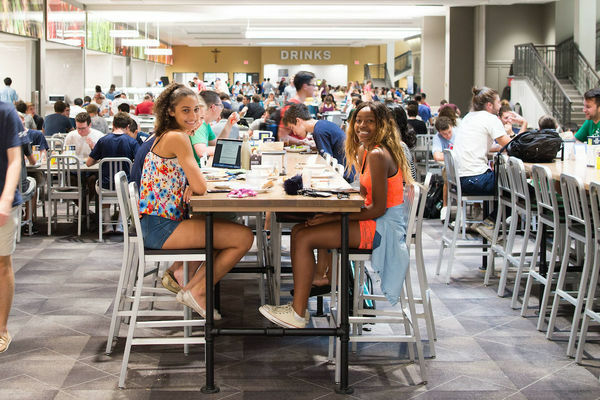 The Campus Community Resource Table in the dining halls is a program designed to permit departments, offices and organizations to go directly to the heart of the student community and provide direct access and exposure where students are. A specifically designed table/work space is in each dining hall where representatives are able to schedule office hours or drop-in appointments to be visible and available to students. Offices, departments and organizations wishing to schedule office hours using the Campus Community Resource Table, should call the dining hall of their choice. Once confirmed, up to two representatives will be permitted access to the dining hall to meet and greet students at the identified table. Originally published at dining.nd.edu on January 18, 2018.